While queuing for the loos during the interval, I overheard a couple of audience members expressing surprise that BLT’s production of The 39 Steps had turned out to be a comedy, not the straight thriller they were expecting. Given that Patrick Barlow’s hilarious adaptation spent nine record-breaking years at the Criterion theatre in the West End, this seems a mite odd. Nevertheless, they were also heard to declare that despite this surprise, they were enjoying the show immensely – as were we all. Loosely – very loosely – based on Alfred Hitchcock’s classic movie (and John Buchan’s original novel) The 39 Steps tells the tale of Richard Hannay, a bored London gentleman whose life suddenly becomes infinitely more interesting when a woman is murdered in his apartment. Who is she? Why did she take refuge with him? And what are the mysterious 39 Steps? Framed for her murder, Hannay flees London for Scotland to find out the answers to these and other questions, reluctantly accompanied by the prim Pamela, who inadvertently finds herself handcuffed to him. With over 150 characters, chases across the roof of The Flying Scotsman, death-defying escapes on the Forth Bridge, bi-plane crashes and final denouement at the London Palladium, it’s little wonder that The 39 Steps was considered unstageable. The solution here is to play it with just five actors and stage it using practically nothing but a couple of freestanding doors, some packing cases, a handful of props, innumerable costume changes and breathtaking ingenuity. In his programme notes Director Wayne Sheridan describes this show as ‘a slick, fast-paced whirlwind of a comedy’. Happily, he had assembled an equally slick, fast-paced whirlwind of a company to pull it off. You’ll notice I say ‘company’; at this point in a review I would normally talk about the efforts of the cast. Here, I feel it only right to praise the efforts of the crew first. 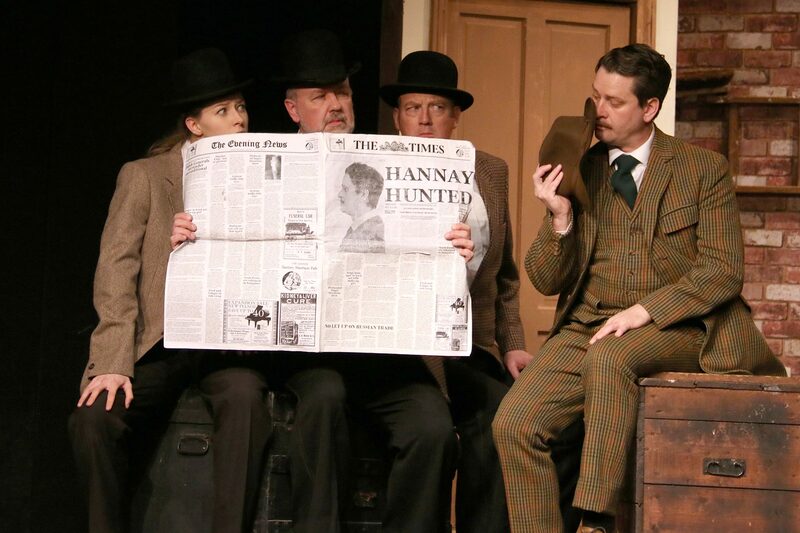 39 Steps lives or dies by the timing of its lights, sound and special effects. This crew timed everything to perfection, even joining in with the action at various stages by holding up signs, sliding props onstage right on cue and even at one point providing a hand to hold a saucepan just when it was needed. The amount of work that must have gone into achieving this slickness boggles the mind. So Wayne Sheridan, Stage Manager Tom Dignum and their entire backstage team should take a very, very big bow indeed. Of course, that’s not to detract from the excellence of the actors. As our hero Hannay, Piers Newman was the epitome of suave, pencil-moustached stiff- upper-lipped derring-do. With pipe clamped between teeth (and tongue firmly inserted in cheek) he provided the perfect fulcrum for the madness and mayhem spinning around him. At his side, Freya Finnerty vamped it up deliciously as the murdered femme fatale and turned in a beautifully-judged comic performance as the prim Pamela, while Steve Williams, Holly Connell-Wallace and Giles Tebbits were simply amazing as the other 147 (or so) characters. Juggling a bewildering array of costumes, hats, accents, improbable facial hair and wigs, they managed to flit seamlessly between spies, railway porters, policemen and even a few inanimate objects – Giles Tebbits assuming the roles of a scarecrow, cloud of low-lying fog, flock of sheep and even a Christmas tree, while Steve Williams turned in a very convincing portrayal of a small Highland hillock (no, that’s not Spellcheck kicking in, I did mean hillock). Favourite moments? The ingenious enactment of a bi-plane crash using twirling brooms as propellors. The gloriously daft, deft spilt-second interplay of the railway porters/policemen scene. Pamela grappling with her giant sandwiches. Holly Connell-Wallace’s dour pipe-chewing Highlands hotel owner. And the image of Steve Williams as the kindly ‘Lady of the Hoose’ complete with ridiculous wig, Terry Jones-style voice and housecoat hitched up to reveal men’s sock suspenders will stay in my mind for a very, very long time – no matter how hard I try to get rid of it. Criticisms? I don’t really have any but were you to put me up against a wall, hold a gun to my head and insist, one or two of the sound effects – though expertly timed – could have been a tiny bit louder. That’s the one and only nit I have to pick. December’s brilliantly creative ‘Into the Woods’ set the bar high for the standard of productions in 2017. After The 39 Steps that bar now looks more formidable than ever. Jolly good show, chaps!